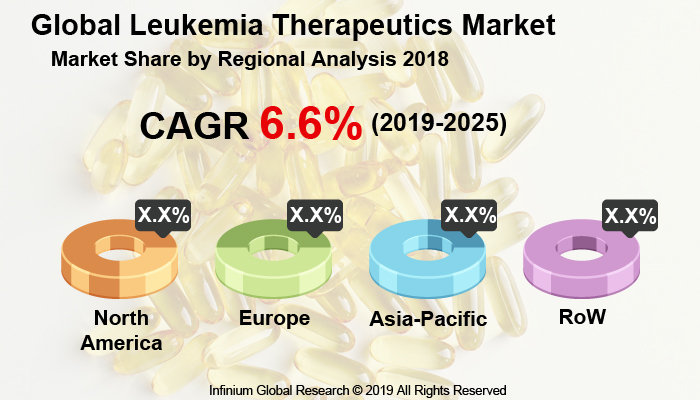 A recent report published by Infinium Global Research on leukemia therapeutics market provides in depth analysis of segments and sub-segments in global as well as regional leukemia therapeutics market. The study also highlights the impact of drivers, restraints and macro indicators on the global and regional leukemia therapeutics market over the short term as well as long term. The report is a comprehensive presentation of trends, forecast and dollar values of global leukemia therapeutics market. According to report the global leukemia therapeutics market is projected to grow at a CAGR of 9.2% over the forecast period of 2018-2024. Leukemia is the cancer of bone marrow, bone marrow is responsible for the blood cell production and it usually affects the white blood cell or leukocytes. Leukemia is caused when due to over-production of abnormal white blood cells, the part of the immune system which defends the body against infection such as invasion by bacteria, viruses, and fungi, as well as from abnormal cells and other foreign substance. According to WHO, leukemia is the most common blood cancer in males. Furthermore, national cancer institute (NCI) states that the rates of new leukemia cases have been rising on average 0.3% each year over the last 10 years. Death rates have been falling on average 1.0% each year over 2005-2014. Furthermore, in United States around 62,130 people are expected to receive the diagnostic of leukemia in 2017-2018. The ongoing investments in R&D of leukemia therapeutics and innovation in drug delivery system are the major factors driving the growth of the market worldwide. Rising occurrence of the target disease and high rate of leukemia cases worldwide is anticipating the growth of this market. Moreover, the introduction of innovative therapies with improved efficiency and less side effects are expected to fuel the market growth over the forecast period. On the other hand, high treatment cost of leukemia is likely to restrain the growth of leukemia therapeutics market. The lack of awareness about the early diagnosis among the population is likely to hamper the growth of the market. Furthermore, increasing healthcare expenditure, the government initiative, and investments for the treatments & research, and increased patient awareness about efficiency and safety, benefits of treatments and advancement in therapeutics are projected to create more opportunities for leukemia therapeutics market. Among the geographies, North America is expected to be largest market for leukemia therapeutics followed by Europe due to the technological advancement, increasing patient awareness, and compassionate government policies in terms of incentives and investments in this region. While, Asia-Pacific is expected to grow fast during the forecast period, owing to the increasing awareness about the diseases, increasing investments in R & D expenditures and growing government support in countries like China, Japan and India is likely to augment the growth in this region. Merger & acquisitions, new product launch and collaboration & agreements are the key strategies of the leading players in this market. For instance, in 2017 Novartis received approval by FDA to launch tyrosine kinase receptor FLT-3 for leukemia. The report on global leukemia therapeutics market covers segments such as, disease. On the basis of disease the global leukemia therapeutics market is categorized into aml, cml, all and cll. The report provides profiles of the companies in the global leukemia therapeutics market such as, Novartis, Amgen, Baxter Healthcare, F. Hoffmann-La Roche, Bayer HealthCare, Astex Pharmaceuticals, Merck, Novo Nordisk, GlaxoSmithKline and Sanofi. The report provides deep insights on demand forecasts, market trends and micro and macro indicators. In addition, this report provides insights on the factors that are driving and restraining the global leukemia therapeutics market. Moreover, IGR-Growth Matrix analysis given in the report brings an insight on the investment areas that existing or new market players can consider. The report provides insights into the market using analytical tools such as Porter's five forces analysis and DRO analysis of leukemia therapeutics market. Moreover, the study highlights current market trends and provides forecast from 2018-2024. We also have highlighted future trends in the leukemia therapeutics market that will impact the demand during the forecast period. Moreover, the competitive analysis given in each regional market brings an insight on the market share of the leading players. This report will help manufacturers, suppliers and distributors of the leukemia therapeutics market to understand the present and future trends in this market and formulate their strategies accordingly.